Posted in From my diaryTagged From my diary, Manuscripts2 Comments on The medieval catalogue of the abbey of Lorsch now online! I’ve been looking some more at Byzantine science. My original intention was to write a series of posts on each area of science. But I’m finding that in fact I don’t know enough about the subjects to do so. In particular knowledge of Byzantine mathematics and astronomy seems to require more knowledge of the works of Aristotle than I possess. So I will probably do no more on this. 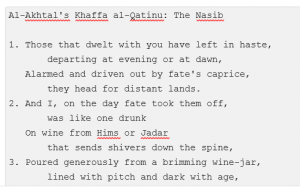 Yesterday I was looking at an English translation of a poem by al-Akhtal, the court poet of the early Ummayads, whom I wrote about here. This led me to wonder how to post a poem on WordPress, which is what this blog runs on. There is no feature in the blogging platform to support the sort of alternately indented lines that a regular poem has. I found quite a number of posts asking why there is not a plugin to make this possible. A bit of experimentation, and I developed a basic wordpress plugin with very little difficulty, that added a drop-down to the editor with a set of new and custom styles to apply to the text. I set up Xampp locally on Windows 10 and installed WordPress inside it. A short article told me what a simple plugin looked like. Another told me how to use a generator to create one, which I did, although I had to create a GitHub account to use it. Finally another article advised me on how to do the changes manually; which I did instead inside my plugin, adding the PHP code to the main generated plugin .php file, and sticking a css file in the root. It all sort of worked, and I pushed it to GitHub. But … it just did not work to format poetry. The problem is not the plugin. The problem is that WordPress strips whitespace in a manner impossible to control. You can insert stuff in a poetic format. But the moment you open the post in the visual editor, that format is destroyed. This is a fundamental problem with poetry in WordPress. It can’t be fixed, unless or until the main developers address the whitespace handling issue. The only possible approach is to format it all as <PRE>, which is not much of an answer and looks terrible. Perhaps it says something about the importance of poetry in our society, that the main blogging platform for writing online makes it impossible to post verse? I need to return to translating Eutychius of Alexandria. I have a couple of books to review. My trip to Rome later this month will not now happen, after my travelling companion became ill. I read this morning that the publishing industry continues its campaign against the SciHub pirate website, through which alone normal people can access most journal articles. Apparently a US judge wants to prevent Americans from accessing it. That should certainly give China an advantage! The site itself is apparently hosted in Russia, fortunately. How long will it remain formatted, I wonder? Well, let’s see! 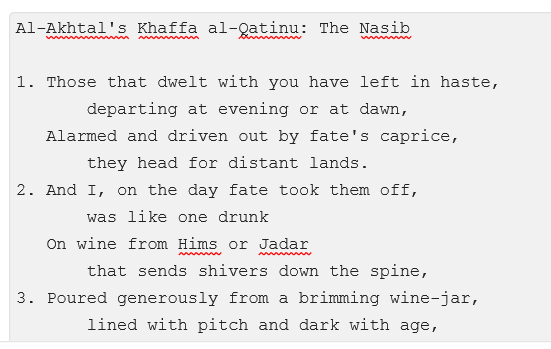 Here is the complete poem, that al-Akhtal delivered before the caliph, while drunk. on Kawkab Hill's two slopes. were maidens lovely as statues. old age's blossom has demeaned! "This is the trench [that Khosroes] dug." through whom men pray for rain. a store of grace and favor. the most clement of men. that sheltered and aided [the Prophet]. only to break out once more. The poem grows on you, as you read it. The caliph was well pleased, as we learned last time. Bibliography is a perilous trade. Let a man once follow a footnote, and he may find his hours and days consumed in searching for he knows not what – and wishes he did! Today I made the acquaintance of a scholar who, as far as I can tell, is scarcely remembered. I first encountered him in a terse 19th century footnote. The occasion was that I started to read about Byzantine Zoology – the study of animals in that period. 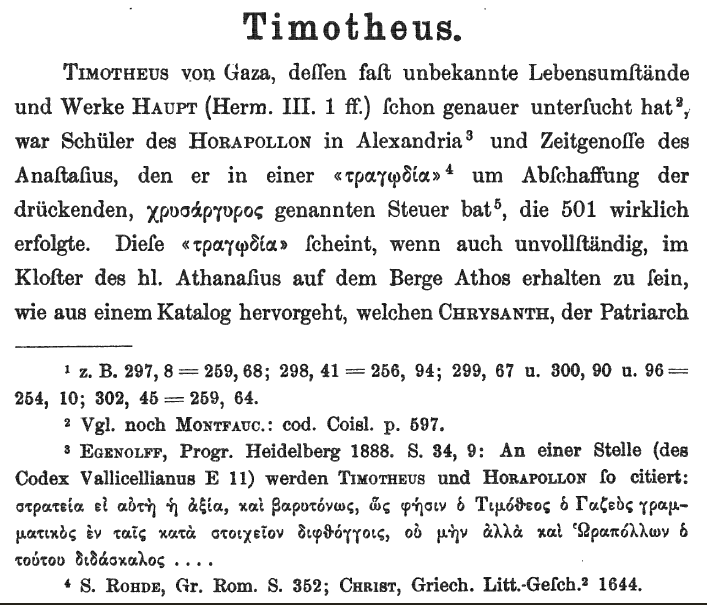 The first author is a certain Timotheus of Gaza, who lived in the late 5th century, in the reign of the emperor Anastasius. The bibliographical source is Herbert Hunger’s Die hochsprachliche profane Literatur der Byzantiner, vol. 2, p.265. But I quickly discovered material online telling me that Timotheus was a pupil of the Egyptian philosopher, Horapollo. Unfortunately the ancient source was not specified. 329. See Seitz  30 with n.3; cf. also Reitzenstein  312. This apparently simple task has consumed much of the afternoon. “Egenolff” is in fact Dr. Peter Egenolff, born in Limburg-Offheim in 1851, and who died young in Heidelberg in 1901. He seems to have spent his life in Heidelberg. There is an online entry for him at the German national library here, which points to a book entry, online in bitmap here, with a couple of pages on his life. Unfortunately the text was printed in Fraktur; and as neither German language nor Fraktur typeface is something I read with ease, the result is that I learned no more. Somewhere there is Fraktur OCR, developed by Abbyy; but it was funded by public money in such a way that it was not made available to anyone. So … unless some German gentleman cares to transcribe it, the entry will remain unreadable. Searching for Egenolff’s work produces a series of pamphlets online, all rather obscure. He seems to have specialised in philology, and in Greek grammatical and accentuation studies. For instance he published two volumes of Anonymi Grammaticae Epitoma, in different places: volume 1 appeared in 1878; volume 2 in 1889. 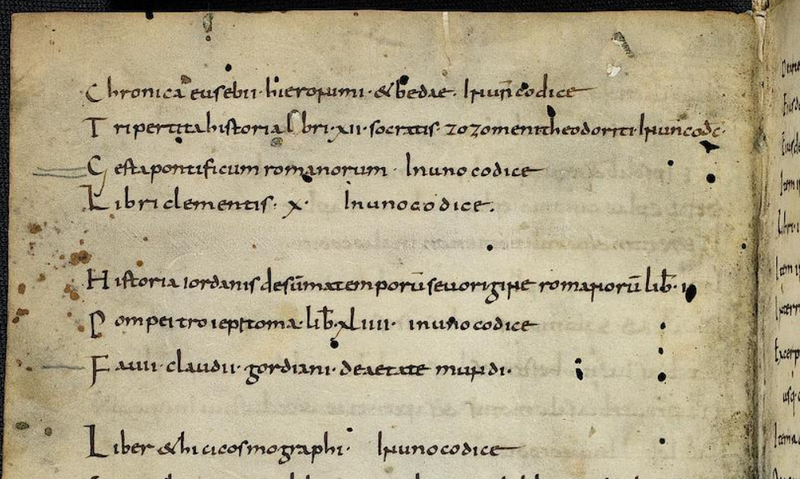 These are extracts from manuscripts, with Latin preface and no translation. For a while I thought that our snippet must be in these; and I wished that I had more time to devote to reading them. He also published a Prolegomena in anonymi grammaticae epitomam; but this was in 1876 (online here). Eventually I struck lucky: the volume is in fact Die Orthographischen Stücke der byzantinischen Litteratur / von P. Egenolff. … zu dem Programm des Gr. Gymnasiums Heidelberg für das Schuljahr 1887/88. (Online here). I think that Seitz could perhaps have picked a better abbreviation than “Progr.”. And on the last page of the booklet – all these items are less than 50 pages – we find the material that I was looking for. But that’s another story. And I have still to look at “Reitzenstein”! My house is still being painted. My books are still in 70 plastic crates in the garage. But this weekend I’ve managed to sneak my laptop back into the house. I’ve brought in the router and got my internet working again! It is such a relief to be able to get online at home. I can get online at work at my current client, but since I know that their office network is subject to repeated virus outbreaks, I don’t connect to my email there. Here I am still surrounded by painter’s gear, and nearly everything still is packed up in boxes in my garage. The smell of paint is everywhere. The carpets are being taken up, and there is dust and dirt in all sorts of places. Living in a building site is challenging, particularly when you have to wipe the paint off your taps, or your vacuum cleaner, where the painter has carelessly handled them. 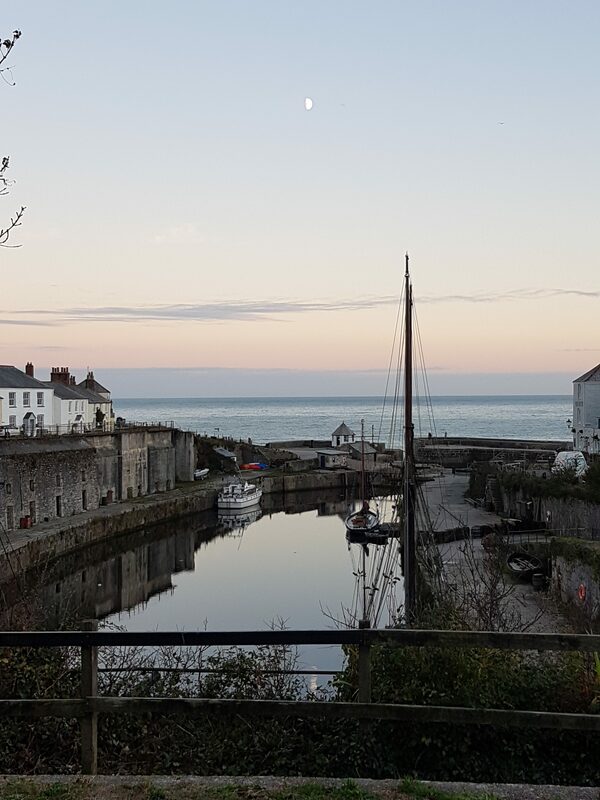 It has become part of my routine every evening when I get home. Also I’m finding that one thing leads to another. What was originally just a job painting all the walls and ceilings and white woodwork is now going to involve replacing all the carpets. Pulling up the carpets reveals damaged floorboards. I’m trying to get a carpenter in, and deal with this. My, these people are difficult to contact! Tacking down a damaged floorboard was enough to stick a nail through a pipe, which meant a plumber, which meant lots of air into the radiators. I’m still bleeding the radiators at intervals. Meanwhile I decided that my original choice of replacement carpet colour – beige – would be depressing when it’s dark or raining, i.e. for 9 months of the year. So I’m spending all my spare moments traipsing around carpet shops. I would just buy the same type as I currently have; but they do not make it any more. You can only buy what they sell. This leads me to wonder … will future archaeologists date our dwellings, not by types of non-existent pottery, but by types of polyester carpet? So there’s no time for Thoughts on Antiquity. But then, I am lucky. If I was married, I’d have no time to do anything. 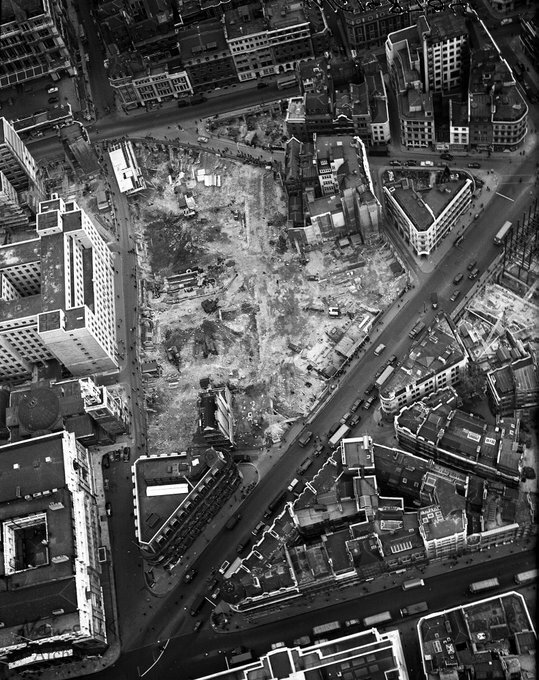 The most interesting thing today is a 1954 aerial photograph of the London Mithraeum, which was here. 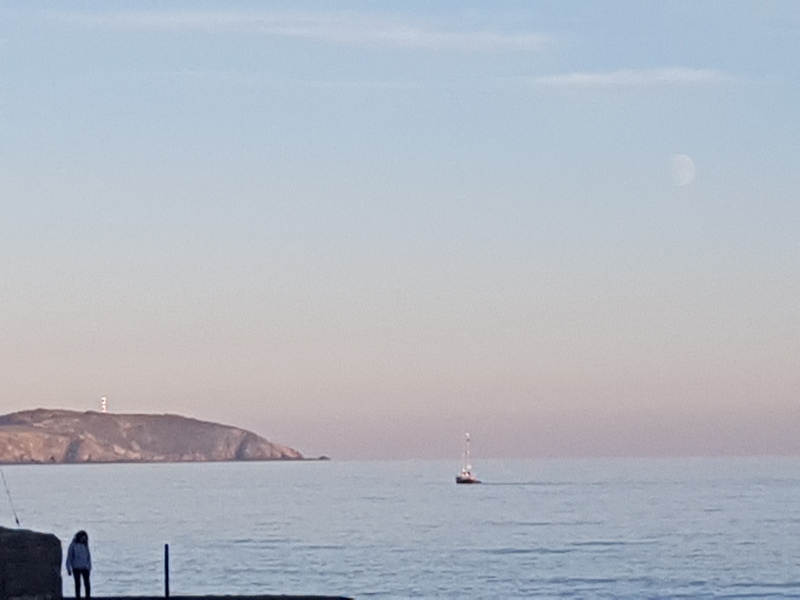 Sadly it’s not that clear which bit is the temple. Not very exciting, perhaps… but as good as it gets! I’ve been thinking again about ways to manage my books. One item that I could happily dispense with is Bart Ehrman’s Forgery and Counterforgery, a big fat worthless book of which I reviewed bits some time back. I wish someone would make a PDF of it; I’m not sure that a Kindle download is quite as useful for reference purposes. I’d also like to see the back of my Ancient Christian Writers series volumes. I don’t have many, but they’d be far more useful in eBook form, and they would take up less space. But I couldn’t see any sign that you can buy eBooks of them. Basically if it is a translation of an ancient text, in the majority of cases, I don’t want it in paper form. The exception, of course, is translations that one can read for pleasure. My copy of the Penguin translation by Betty Radice of Pliny’s Letters is one such example. It can be read for pleasure, and I have done so, many times. The four volumes of Cicero’s letters to Atticus, and to his friends are another – and I have no idea at all how to get an eBook of these, long out of print, volumes. I’m not quite sure whether I will read through these again. At the moment I am not in the mood; but I have done so several times in the past. Maybe the answer is to find some young man with time on his hands who would sit in front of the scanner for a few hours, and create eBooks of some of my crucial books. But where do I find this person? Somehow, I must regain control of my book collection. I’ve also been reading Lindsey Davis’ “Flavia Albia” books on my smartphone, via Kindle. Davis is famous for the “Falco” series of Roman detective novels, set in the Flavian period. The “Flavia Albia” series are “Son of Falco”; or rather, “Daughter of Falco”. I bought the first three volumes on Kindle and read them, and they slipped down easily enough. Recently volume 4 of this series appeared, and I bought it on paper; but in fact I would have been just as happy or happier with it on Kindle. I don’t know that I shall read it again, so the paperback will go out to a charity shop. Maybe one-time or two-time novels should be read electronically, rather than on paper? But … what about our eyes? Eyestrain is such a problem for smartphone users. 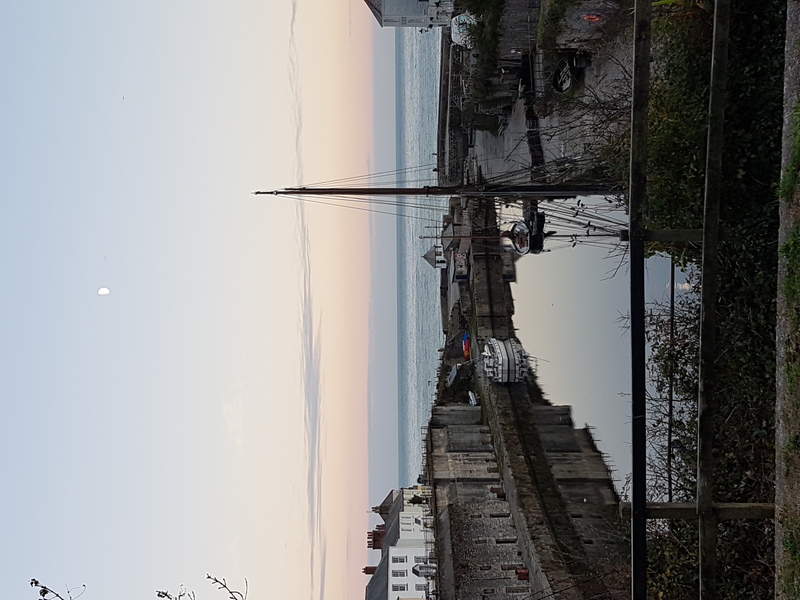 Today I broke off from my house-related chores, and took a restorative walk by the sea. While doing so, I saw that a new information board had appeared there. This referred to a building on the sea front, which was recently – within a year or two? – demolished, and was called the “long shelter”. I always felt that it was an attractive building, and that it should have been repaired rather than demolished. Well, the information board told me that the demolition took place in 2008! Was it really 8 years ago? How fast the years now fall, like leaves in autumn after the first frost. I was reminded yesterday of “Thoughts on Antiquity”. This was the blog, at http://neonostalgia.com/weblog/, on which I started blogging. It was the blog of Chris Weimer, who invited me to write a few posts. These I copied here long ago; and just as well, for his blog has pretty much vanished. Looking at Archive.org, I see the last post was 24 May 2010. The last snapshot to show it was on September 26, 2010, and the next snapshot, December 17 2010, shows only an HTTP 301 code. I wonder what happened to it? Indeed I wonder what happened to him? I see that I have an email address … I must write and ask. I’ve had a series of minor health problems for most of the year, although I don’t believe anything is really wrong. On Tuesday I go into hospital as an outpatient for a somewhat unpleasant examination. Wish me luck! I have lived at my current address for nearly 20 years. When I took possession, on 10th February 1998, I was staying in a hotel with my property in storage. So I arranged for the place to be painted throughout before I moved in, on the 20th. I have never been able to arrange for a painter to work without moving out again, so the house decoration has gradually grown rather tired. It is not bad, but it won’t do for another 20 years. I must repaint now. This summer I was finally able to find a painter who was able and willing to do the deed. He arrives on Monday 17th October, 2016, in fact, if all goes well – for these gentry are notoriously unreliable. He will move large chunks of furniture around, in order to paint. But there is one important exception. Nobody can move bookcases which are full of books. So this requires me to empty my book cases, which are mostly in my study bedroom. This I have been doing, for over a week now. The cartons I have placed in my garage; 24 of them so far. It is difficult to find cartons suitable for books. I have been driven to buying 32 litre shallow “underbed” plastic boxes with lids, available at £3 each, from Wilkinsons. This evening I collected a further 30. The process of packing is itself a painful one. Without a copious supply of boxes, it is even more stressful. You find yourself agonising over how to fit stuff into the boxes. With enough boxes, you don’t worry. Buy lots of boxes. It reduces the stress. Tonight I have at last emptied every visible shelf in my study. However there still remain many shelves in the large cupboard, including a stack of academic books. Even these I have started, and may hope to complete tomorrow night. This is well; for I have little space remaining in my garage. It has been a heavy task for a man no longer young. Will I ever have the strength to do it again? In a way, this makes me think. Should I really own so many books that I can’t manage them? I say that I own many; but it is little more than 3,000, I would guess. How many of these books will I never look at again? It is all very well to retain books, especially academic books. But I do wish that I had almost all the academic books in PDF, rather than in paper. Will I have another purge, I wonder? Clearing my shelves is like a journey into my own past. I come across offprints, send unsolicited by a kindly academic. Vast amounts of old hard disks litter my cupboard. There are endless dictionaries of ancient Greek, from the days when I hoped to write a Greek translation tool. Should I dispose of these? Probably I should … for I no longer have the energy that I did. In other cases I come across books that I know I will never reread, for I have read them out over the years. Yet they are part of me, and made me who I am. What to do? Men of my age commonly deceive themselves that they will have more time when they retire. If any of my generation can ever afford to retire, they may find different. I spent two months at home this summer, in indifferent health. Five days ago I went back to work, and found the first two days very awful. I then had some very stressful and tiring days. Yet … I find myself more alert, fitter, and in better health, now that I am working. The “curse of Adam”, that all of us must work, turns out to be a blessing. With “retirement” often comes a vegetable state. As eBooks become more common, possibly it will be possible for me to buy or otherwise acquire eBooks of some of the academic stuff. I must invest the money, I think; and buy back control of my shelves! This evening I combined the English translation of the Old Slavonic text of De Lepra with the translation of the Greek fragments of the same work. The latter were considerably fuller, where I had both, and sometimes with startling differences. However I hope to have this completed before too long. This will complete the four short works of Methodius, leaving some Greek fragments, but also two large works: the De resurrectione and the De autexusio (On Free will). The latter has a French translation by Vaillant. I’ve worked out the price of translating both, and it is far beyond my means. If it is to be done, it must be done by a grant. Fortunately I have such a body in mind, so this evening I have been doing some calculations. It is relatively straightforward to work out a price for the Old Slavonic of both works, based on the page count of the manuscript. That said, Vaillant did edit the Old Slavonic text, so in this case we do have an edition to work from. But working out a price for the Greek is much harder. It turns out that there is an awful lot of Greek extant for these works. The total for the Greek is 50% of the total for the Old Slavonic! A further issue came to my attention when skimming through Vaillant’s preface. It seems that the Old Slavonic translation is often almost unintelligible. The reason for this, says Vaillant, is that the translator simply substituted for each Greek word the equivalent term in Old Slavonic, without bothering much about whether the resulting sentence made sense! In fact he says that often the best thing to do is to reverse the process – to work out what Greek word lies behind each Slavonic word, and then see what the sentence actually originally meant in the Greek! If we are to take this seriously – and translators are known to exaggerate the difficulty of their achievement sometimes, at the behest of their publishers – then this would mean that only a translator fluent in both Greek and Old Slavonic could make a translation of Methodius. Only a native English speaker fluent in Greek and Old Slavonic could make an English translation. Does anyone know of such a prodigy? But I suspect that this is a tall tale. Doubtless this may sometimes be the case; but I don’t think that I should abandon the effort of getting a translation made for such a reason. It is late now, tho, so the application process will have to wait until another day. One other point caught my eye. Interestingly Vaillant refers to an unpublished French translation of an Armenian recension of De autexusio. I wonder where that is now? At least I got Procopius done. But I really feel he’s too late a writer for me to worry about, in the survey of early Christian writers who wrote about Matt. 27:25. I don’t know about anybody else, but I am getting a little fed up of this particular story. Perhaps it’s time to write about something else, even though we are not done yet. Jonathan Armstrong’s translation of Eusebius’ Commentary on Isaiah arrived today, and interesting it is too. At various points Eusebius signals where each book of Origen’s lost Commentary ceased. It’s a reasonable assumption that there’s a relation between the texts, if Eusebius thought that worth doing. He also refers to his Onomasticon in the work. I really ought to start thinking about Methodius of Olympus, and getting a handle on the Old Slavic versions of his works again. And Eutychius is still not done – it would be nice to do more of that. Always so much to do. But I think that’s enough for tonight! It’s the end of a long hard week, and I can’t face any more Procopius of Gaza tonight! So I’ve instead been downloading a few volumes of the Patrologia Graeca from Google Books to my hard disk. It’s always helpful to have these locally, as hotel Wifi is not to be relied on when you want to work. I’ve also taken the time to tweak my copy of Google Chrome browser, so that it downloads the PDF rather than opening it in a browser window. Unfortunately nothing I could do would have the same effect in IE! A message from my local library informs me that the IVP Academic translation of Eusebius of Caesarea, Commentary on Isaiah, is now sitting awaiting a visit from me. Attending to this will probably take up much of Saturday. Anybody who spends 6 days of his week in front of the screens is well advised to do the opposite on Sunday, and I certainly will. So finishing off Procopius may have to wait until next week. I’m beginning to wonder whether the finished post full of references should in fact be made into an external web page somewhere. It’s really a bit long and unwieldy for a blog post. But there is no need to do so yet. I will continue to work on individual authors in individual blog posts. Oops. I was just preparing the Italian text for the next chapter of Eutychius when I noticed that it was chapter 14; while my posts for the last five chunks were supposedly “chapter 12”. They should, of course, have been headed “chapter 13”. I have gone back and fixed the headings. The mistake was easy, because the Italian translation does not contain running headings, so that, once in error, I had no reason to examine the chapter heading again. I remember looking at British Library Additional manuscript 12150, which is a Syriac codex written in 411 AD. This has running headings throughout, in the hand of the scribe. It is a pity that the Franciscans of Cairo, who printed Eutychius, were unable to do the same. I shall press on with Eutychius, although I feel rather ashamed of translating an Italian translation into English, and doing so badly since I don’t know Italian and rely on Google translate plus a smattering of knowledge acquired along the way. But the result still makes Eutychius more available than it would be otherwise. With luck someone qualified to do so will take the Arabic text and make a proper translation, and make it accessible online. The next chunk of Eutychius looks rather theological to me. It is concerned with something of the utmost importance to Eutychius and his fellow-Melkites, a minority in Egypt – the council of Chalcedon, at which the monophysites were condemned. I hope that I can make sense of the text, even though I only have a sketchy idea of the theology. If not, I hope that you will forgive me. Today I heard from a correspondent, asking me about the online translations of John Chrysostom’s Against the Jews; or Discourses against Judaizing Christians, as the Catholic University of America Press somewhat presumptuously calls them in the Fathers of the Church vol. 68 translation by Harkins. Of course I directed him to that volume. I believe that a critical edition of the text is in progress, in Germany – the discoverer of most of sermon 2, Wendy Pradels, is involved – and when this is complete then a fresh translation will be called for. Considering the importance of the text, one can only hope that efforts will be made to make that new translation available online. There really is no purpose in publishing such things offline any more. It’s been a while since I myself have commissioned any translations of ancient texts. At the moment I am at home, waiting for another contract. It would be unwise to agree any fresh outgoings until the money tap is turned on again. Wish me luck! Once someone agrees to employ me, then I will simultaneously have less time and more money. It looks as if the general election in the UK is interfering with the UK contract market, just as it did in 2010. I suppose, logically, that few corporations would commence an expensive project now, when they could wait a month and know what kind of regulatory environment they will face. So they do not recruit, or sign contracts with small businesses. So the delay is something of a test of patience. In the meantime, I can do a few projects myself!